This new year I write you with the highest hopes you are happy and putting your energies where you most want them to be. If there is one thing the last year did it was remind me of that obligation we have to each other and ourselves. I spent last year in a graduate program focusing on studio arts and moving images here at the University of Illinois at Chicago where I am keeping busy on several groups and committees and serving as a PAGE fellow. It has been a great opportunity to focus on my own work outside of organizational and administrative roles I have been inclined towards in recent years, and also to focus on education – I am TAing a course on Tactical Media with Brian Holmes and have started to develop my own courses and even reflect on my own art education experience (check out this presentation I developed for BFA students about “life after art school” last spring). I am continuing into my 2nd year developing last year’s research into a video about Karl Hess who was an Old Right republican turned New Left ecological anarchist turned libertarian survivalist. I’ll also be expanding in some new directions with a collaboration that took place this summer at the Alternative Press Center dealing with visual representations of crisis. I am trying to make other short videos to keep myself engaged in other ideas while this long-term effort develops, and one such video was a short clip I shot at one of the inspiring Occupy Chicago festivities last fall (check out a blog post on the subject here and the video below). 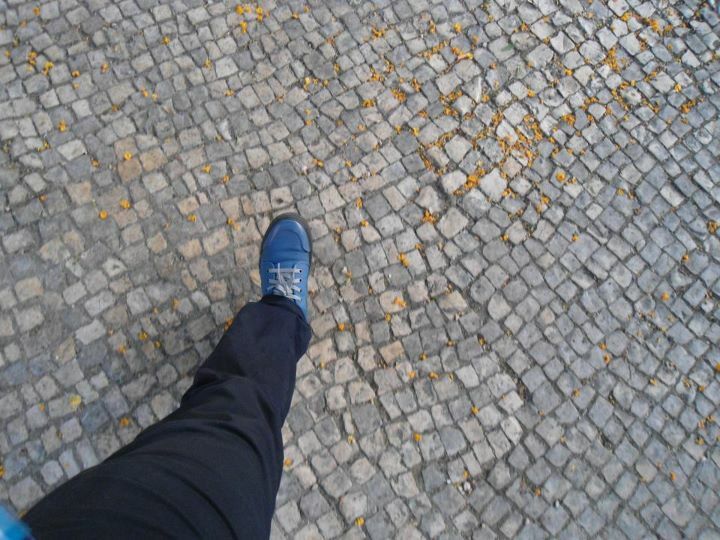 The main updates I wanted to share with you are a few new publications, websites, and miscellaneous links that give an indication of the things I’ve been caring about this last year that I think overlap some with things you care about. 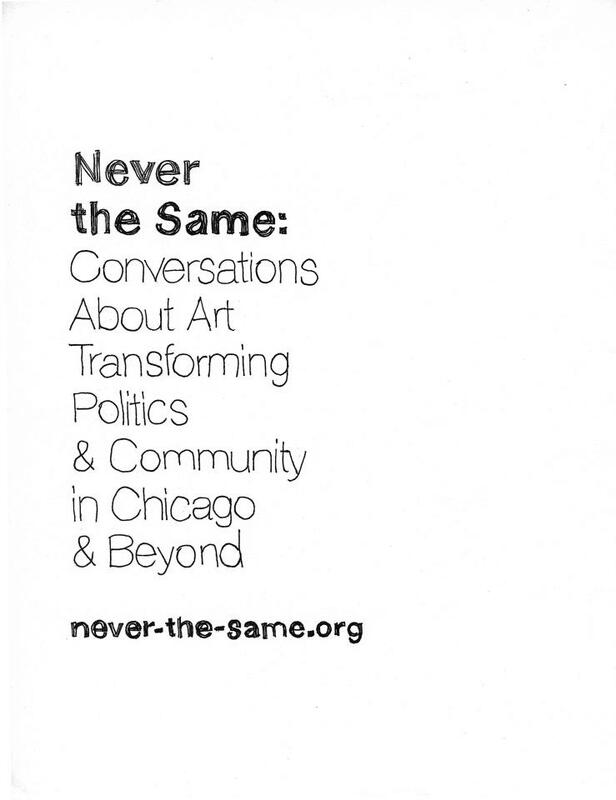 Last fall Rebecca Zorach and I launched a new online publication and archive about social and poltical art in Chicago called Never The Same: Conversations About Art Transforming Politics & Community in Chicago & Beyond at http://never-the-same.org. The summer was spent interviewing people like: Deptartment of Space and Land Reclamation; Aaron Hughes; Jorge Felix; Mary Jane Jacob on Culture in Action; Turtel Onli; Diasporal Rhythms; Calles y Suenos; AfriCOBRA; Homocore/SPEW; Ladyfest; and my dear friend Dara Greenwald who recently passed away. There is also a physical archive of publications and media we are putting together that focuses on the work of people we interview as well as the friends and fellow-travelers we have collected materials from in our time doing art activities in Chicago. This project got some press earlier this year from the likes of Chicago Art Magazine and Bad At Sports (this interview also covers my work with AREA and thoughts on socially-engaged art in general). The other big publication release was the website at peoplesatlas.com and book Notes for a People’s Atlas, a project I’ve been coordinating for the last 6 years with folks from AREA Chicago. We’ve done mapping projects in 25 cities all over the world and finally compiled them all into a book (published by AREA Chicago) available for order from Half Letter Press that was released in November at the Depaul Art Museum here in Chicago. There’s an interview about the project on the art blog Bad At Sports with some artist friends Robby Herbst and Ryan Griffis. In other publishing news, I have published a number of book reviews covering books my friends have written (such as Living as Form; Revolution As Eternal Dream; Hillbilly Nationalists) with Afterimage and Landline Magazines; my interview series about art, community, and place conducted over a year and a half with Dan S. Wang was released in the beautifully designed and edited Deep Routes: The Midwest in All Directions; you can also still order the catalog for the spring 2011 project Visions for Chicago from the local Chicago publisher Green Lantern Press which was selected by the Chicago Tribune as one of the best art projects of that year; and you can purchase my 2010 book Farm Together Now from the publisher Chronicle Books. A collaboration that resulted from that book has continued with Family Farm Defenders when last fall I conducted a live-interview with 85 year-old John Kinsman, co-founder of this Wisconsin based organization, at the Hull House Museum in Chicago (see the videos). The transcript of that dialogue was turned into a booklet documenting his life and work. Last year ended up being packed with exciting opportunities to share ideas I’ve been working on with various public audiences, including moderating a panel with locally-oriented artists from the midwest about the theme of “regional art ecosytems” at a conference for arts administrators and organizers called “Hand in Glove” that was put together by local arts organization Threewalls (the full video is on their site); in a long-form interview with BenPR about nearly a decade of collaborative work I was engaged with in Chicago; co-organizing a selection of videos off of youtube on the theme of “Power” (all videos are on this link) with filmmaker Deborah Stratman for an event series called Youtube Assembly; AREA Chicago published an essay i developed with with Barbara Ransby, Bill Ayers, Harish Patel and Alice Kim on the necessity of community cultural/education centers for development of social movements; participated in a roundtable “Learn In” discussion while visiting Germany this summer for documenta13 in the And And And project space with a bunch of my favorite Chicago artists like Claire Pentecost, Brian Holmes, John Preus, and Michael Rakowtiz (look for my review of that show soon); and finally at the end of the year my essay detailing my time with AREA Chicago between 2005-10 as independent education initiative was published in by an arts-research group in Barcelona called Sitesize and recently by AREA itself on their new website. While I hunker down in school for one more year and start thinking about my own “life after art school,” I am compelled to reach out to you and thank you for your ongoing work and friendship. This year has been a real challenge and it cannot be understated how much I have leaned on and learned from my people. Please let me know what you are up to and holler at me soon. Also, my new permanent address for mail is my studio: 2040 N. Milwaukee Ave 2nd Floor Chicago IL 60647.